Stay at this ideally-positioned Melbourne motel, located in the suburb of Noble Park which is 20 minutes from the city center, 15 minutes to Frankston and 12 minutes to East Link, Monash University, Chisolm Tafe, South Eastern Hospital and Monash Hospital are all nearby. 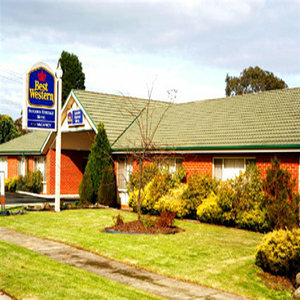 The BEST WESTERN Sandown Heritage Motel offers quiet and spacious accommodation in Melbourne. All rooms are on the ground floor and feature queen beds and split-system air conditioning. Other facilities at this Melbourne motel include free Wi-Fi, a heated swimming pool, BBQ, guest laundry and off-street parking. Guests staying at the BEST WESTERN Sandown Heritage Motel will be located close to Sandown Park Racing Complex and Springvale Botanical Cemetery. The Dandenong Ranges (William Ricketts Sanctuary) is only a half hour drive away and the unique attraction of Philip Island and its fairy penguins is an easy 90 kilometers away. For superior customer service and a convenient location in Noble Park, Melbourne, make a reservation at the BEST WESTERN Sandown Heritage Motel today and save!